Pablo is an award-winning graphic biography on Picasso’s early years in Paris as a struggling artist before he made his mark in the art world. It was originally published in French with four volumes. In this English version, it is compiled as one single book. The book is published by SelfMadeHero- an independent publishing house. This graphic novel is meticulously researched and created by Julie Birmant and Clement Oubrerie, whom some readers may be familiar with Oubrerie’s art from the comic series, Aya. It is colored by Sandra Desmazieres. 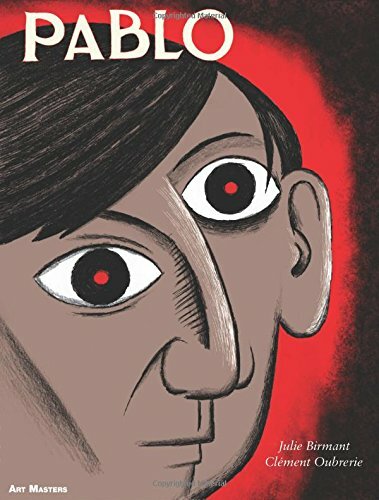 There are currently no lack of biographical books on Picasso but “Pablo” still manages to bring something different and offers a refreshing perspective to Picasso’s turbulent youth in Paris. It is a story about his transformation to the Titan of the art world. The graphic novel deals not just with Picasso. There are a myriad of significant characters that shapes his youth in Bohemian Paris. From Max Jacob who believes in his genius before anyone else, the art dealer-Gertrude Stein and Picasso’s greatest rival -- Henri Matisse. Not to mentioned his muse - “La belle Fernande“. All these presents a wonderful backdrop to bring the graphic novel to life. Birmant did a fantastic job , fleshing out Picasso’s psyche in the writing, without overly caricaturing Picasso. Picasso’s raw emotions are meticulously fleshed out in this book. There are a lot of details for the readers to enjoy. In essence, Pablo is a story worth reading on Picasso, his breakthrough in artistic developments and the cast of colorful characters that dot his life. Oubrier’s seemingly loose drawing style adds a whimsical charm to the graphic novel. The drawing medium choices employed throughout include ink, charcoal and crayons. The myriad of drawing medium creates a visual style that fits the graphic novel well. Each panel is lavishly rendered, with great composition and vivid details. What I loved about Pablo is how well the creators complement each other so effortlessly and this graphic novel brings out the best of this book. If I may nitpick, it will be the font type that was used. I felt it’s a little hard to read them at times as it seemed so thin. This is definitely a book worth getting and highly recommended for art lovers who want to know this “missing gap” in Picasso’s life before he became famous.